DEC What are you Saying? Day 9: Rhinos? What Rhinos? How big is the byThom staff? How long has this site been around? How is this site supported? Can I Advertise on bythom? Configuring Sony Mark III New! Three New Nikkor Lenses Introduced. Nikon today introduced two new FX lenses, and one DX lens. Let’s work our way up in excitement by starting at the bottom… Article on dslrbodies.com. 10-20mm f/4.5-5.6G AF-P VR DX data page. 28mm f/1.4E data page. 8-15mm f/3.5-4.5E fisheye zoom data page. Just a reminder, the D3400/D500/D750/D810 instant rebates are scheduled to end later this week. There’s no guarantee that they’ll be extended, though I suspect that since we’re about to enter the last month of a fiscal quarter, there will be lots of new deals. You'll also find comments about the bags themselves, some support gear, and a few other things on those pages. I try to keep those pages up-to-date, and they've all just been updated to reflect my current usage and thoughts. Sony RX100 Mark V Review. The Sony RX100 Mark V is the fourth in a series of iterations of the original 1" compact camera Sony produced, the RX100. Article on bythom.com I've also reorganized the review header on this site into a menu so that you don't have to scroll through everything to find the review you're looking for. Sony FE Now at Almost Two Dozen Lenses. 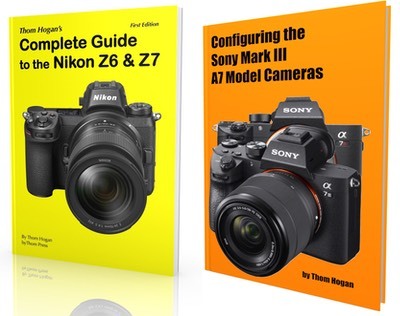 Today Sony announced two more FE lenses for their A7/A9 mirrorless cameras: the basically pre-announced 16-35mm f/2.8 GM, and the unexpected 12-24mm f/4. This brings to 23 the total number of FE lenses that are available directly from Sony (Zeiss and others also make their own FE lenses). Article on sansmirror.com. 16-35mm f/2.8 lens data page. 12-24mm f/4 lens data page.